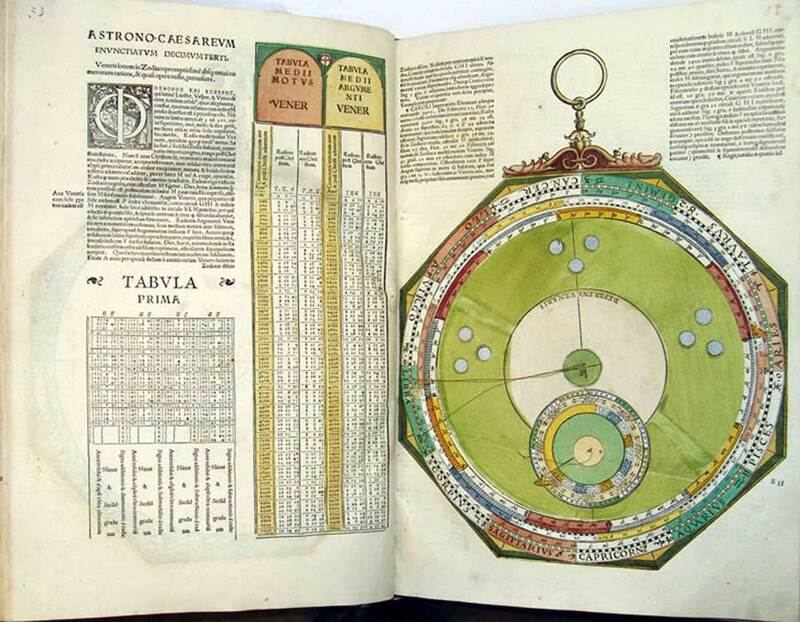 Based on the prevaling Ptolemaic system (the author was a contemporary of Copernicus), the book presents some scientific advances, such as the observation that the tails of comets always point away from the sun and the recommendation that solor eclipses can be helpful in establishing longitude. It reflects Apianus’s pioneering work in astronomical and geographical instrumentation. But it is most notable as a brilliant example of book arts. Although Apianus gets the press, I think that the artist, Michael Ostendorfer (ca. 1490–1549), deserves much of the credit for this work, as the gorgeous hand-painted woodcut images are an exceptional feature. Check out the following examples (the aspect ratios vary slightly because of conditions of photography and cropping), then view the video at the end. A pdf of the entire book can be downloaded here.